The color space is three-dimensional: to uniquely identify a color, you have to specify three dimensions. There are many ways to specify a color: the most common one (albeit not the more natural one to understand) is the RGB space: each color is identified by the intensity of pure red, pure green and pure blue components that, when mixed together additively, construct the desired color. I emphasize additively because when we think about “mixing” color (when we paint with oil or watercolor) we don’t actually compose color the same way our eye does. 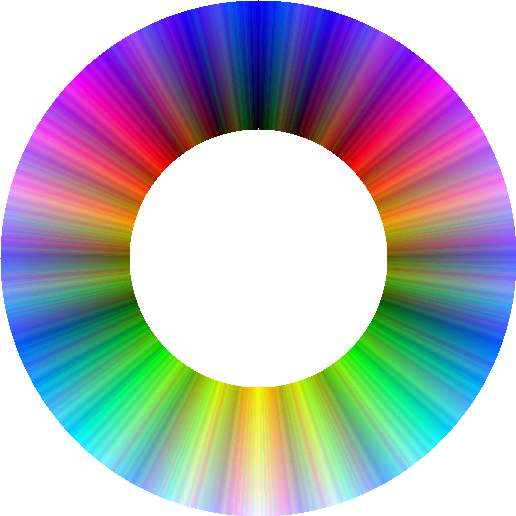 In the RGB space, there are three numbers you specify for each color: and so yellow can be defined as (1.0, 1.0, 0.0) because it consists of max intensity red and green and no blue. Violet (like the color of this flower) can be defined as (0.6, 0.3, 0.7). Similarly, there are other ways to describe a color: the HSL space, that I find fairly intuitive, describes a color by specifying its hue (the location on the rainbow), its saturation (how vibrant is the color) and lightness (how bright it is). 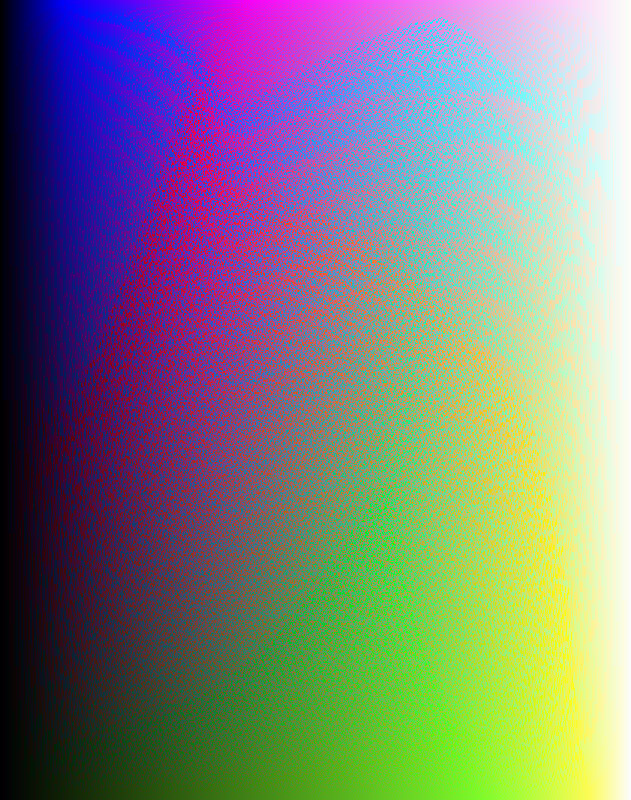 Again, three dimensions (why the color space is three-dimensional is an interesting question…). This fact makes it hard to design user interface elements that allow you to pick a color (color pickers): the screen is two-dimensional so you either need a slider or some other way to change the third dimension, or you will see a selection of all colors. Being a visual person, I wanted to have a picker that displays all the colors at once, without some stupid slider. The problem, however, is that we want the mapping to be smooth, i.e. ideally we would like nearby pixels to have similar colors, and the mapping above (and in fact most mappings) won’t guarantee this. This is where math comes in handy, specifically the field of space-filling curves. I kept one dimension (say, the blue component)–that will be my X coordinate of the resulting picker. For the other, I used a Hilbert-like curve to collapse the green and red components into one Y coordinate. A nice thing about Hilbert curves is that they are somewhat smooth: in this picture, if you pick two neighboring points they are likely to be close to one another on the curve. I’ll leave as an exercise for the reader to determine the actual expected Euclidean distance in color intensity for randomly picked two neighboring points on a Hilbert curve. Besides looking very Tolkenian, the ring has a pleasing æsthetic to it. Still, it’s somewhat hard to pick out the color you want because the colors are fairly scattered (if your mouse if off by one pixel you may be picking a totally different color). The next approach was to be a little smarter with the choice of dimensions. 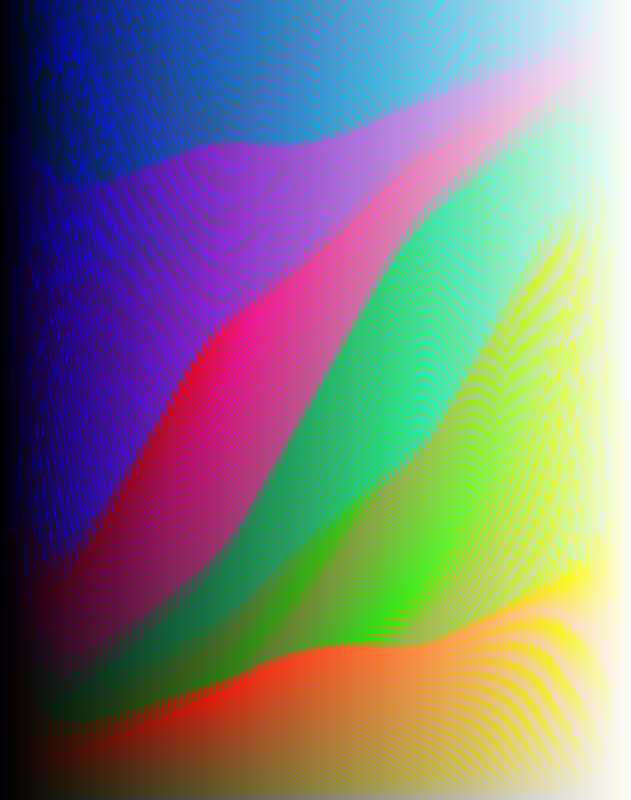 Instead of picking one of the components to be one dimension and try to collapse the other two, I chose the light intensity of a color as the horizontal dimension and then collapsed all colors of a given intensity into the vertical dimension. The advantage of this approach was an increased smoothness: all colors along a vertical line had the same intensity; and because the intensity function is linear in the values of R, G and B (it’s a weighted average of the red, green and blue intensity), the colors on a horizontal line are all similar. Images 3 & 4. Bundling similar colors together (to have fewer “boundaries” where neighboring colors differ significantly at the expense of more pronounced boundaries): I used a heuristic that “favored” one component over another. Image 5. Pixels ordered by saturation - funky!